In a world full of diet cheats and unhealthy food, you need something that can prove to be an energy booster for your body. Therefore, detox has been introduced in the market to give your body the necessary energy to pass the whole day without getting tired up. Scientifically proven, detox helps to cleanse your body by eradicating all the non-essential chemicals which can be harmful if they tend to pile up in your body. If you’re in the high-gear of achieving your goal, you must take your diet into considerations. You should be conscious of what you eat and what you are putting into your body. No matter if you’re following a healthy diet, there is a need to cleanse your body. Therefore, for this particular reason, detox drinks are manufactured which helps to improve your digestive system, circulatory system, as well as your immune system which, in turn, improves your health making you live a happier, healthier life. In this article, we are going to cover each every bit of these two miracles one by one, making it much easier to choose any one of the above-mentioned detox teas. Without wasting any more of your essential time, let’s get straight into the facts. As the name indicates, teatox is the amalgam of tea and the detox. Instead of drinking tea, you can choose to drink this all-natural teatox which benefits your body in quite a lot ways than you imagine. You can drink this detox tea in place of different sodas, unhealthy drinks, and beverages and make yourself healthy in no time. 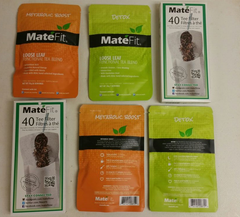 MateFit teatox detoxifies all the unnecessary chemicals from your body naturally which helps to boost up your metabolism. When your metabolism tones down, you not only feel lethargic but also it makes it difficult to lose weight. Hence, this miraculous drink speeds up your metabolism by removing all the hindrances.